Ask fellow campers about "Lake Havasu State Park" and nearby attractions. No full hookups, only water and electric. Some really nice sites that backup to the water. Busy park, need to plan ahead for reservations. Lake Havasu (home of London Bridge) is a busy city, lot of activities each weekend. We camped at Lake Havasu State Park in a Motorhome. I was given a large pull/thru black top site with water and 50 amp service. Picnic table, charcoal grill & fire ring were on the gravel site. Site was large enough for my 42' 5th wheel and truck to park. The park is easy to maneuver in. The park is pretty much in the open to use your dish and close to the boat launch if your towing a boat. There is a dump station to use when you leave. They have a sandy beach and the park is two minutes from anything in town. I didn't use their bathrooms and there is no wi-fi or cable tv. 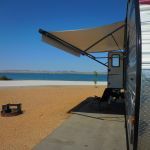 We camped at Lake Havasu State Park in a Fifth Wheel. The park is 2 minutes from town and 10 minutes from the London Bridge. The park has a Sandy Beach and big boat launch. 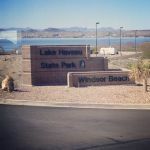 We stayed at Lake Havasu State Park for two weeks. The location of the park is great! The park amenities are lacking. The restroom is too small, outdated and dirty. The skylights dripped on me when I was trying to shower. The showers are NOT clean. They are mopped out with a Lysol smelling product but nothing was cleaned, hair in the shower, etc.. The restrooms are amply supplied. There is no dog park and no playground. Most sites are not level. There are no sewer hookups. Our site was had a nice paved pad which was not swept or blown off. There was sand and gravel covering the entire pad. They are adding 21 cabins to the park. Seems like they would want to keep up what they already have instead of adding to the problem. We camped at Lake Havasu State Park in a Motorhome. We enjoyed the swap meet on Sundays, just up the road. This is a nice park on the lake where you are close to town and amenities but feel like you're far away. We enjoyed the seeing cottontail rabbits, quail and wildlife surrounding us. Although, the park was full of snowbirds like us, it wa exceptionally quiet as it was preseason for the large boats that you typically see here. Check in was smooth and they have a very large overflow area for dry camping at $25/night which seems expensive until you realize that there is no space at the BLM locations closeby and all of the parks are full! We had a reserved site that just required some small blocks under the front wheels. Verizon cell was strong. We camped at Lake Havasu State Park in a Motorhome. Take a boat trip to Topock Gorge if you have the time as it very scenic. Wanted to stay on the Colorado River, so we paid a little extra and stayed at Lake Havasu State Park. We were as close to the beach area as we could get. Site was spacious and level, and hookups worked well. Had a nice fire in the fire pit and watched low flying motorized hang gliders go by. Ferry in town came out near us and headed over to the California side of the river. Some sites have lots of shade. Overall a nice state park. We camped at Lake Havasu State Park in a Motorhome. Very nice state park right in the city, but just a bit pricey. Power and water at the site and a dump station. Although when the wind blows it can get uncomfortable. 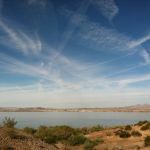 We camped at Lake Havasu State Park in a Travel Trailer. Nice park, kind of a goofy layout site wise but great location and value. Too many really stupid large boulder placements in the park, larger motorhomes and fifth whells need to drive very "heads up" in this park or those boulders will damge the side of your vehicle. Why someone would put those idiotic boulders so close to interior roads is a mystery. Someone who knows nothing about driving larger trailers and motorhomes, that is who! We camped at Lake Havasu State Park in a Motorhome. We like this park to escape from Pacific Northwest winter weather. The biggest complaint is the occasional loud speed boat noise. The other strange contraptions (air and water) were interesting to see. This is desert on the lake. Sites are defined but in a haphazard arrangement. There are some good waterfront sites if you can get them. Realize there is a waterfront path that is closer to the water than these sites. Many other sites have good water views. Site 20 slanted a little from front to back. We did slight leveling on the front tires. From site 20 the water view is past 15 and between 14 and 16. Most sites are visually close which was fine for this park experience. Sites 10, 16, 36, and 38 were some nice waterfront sites. The bathrooms/showers are old, rustic, painted cement and cinder block. Water was hot. It would be nice if they updated these facilities. We camped at Lake Havasu State Park in a Motorhome. The London Bridge is within walking distance. It took us 25 minutes. From there we did the channel walk and had lunch at Burgers by the Bridge. Beautiful campground close to so much that we could walk. Beautiful beach area and lake view. Events right on the lake in front of park. Looking forward to next year's visit here. Very quite and safe. We camped at Lake Havasu State Park in a Motorhome. Short term overflow is great area or full service 30-45 per night. Park is amazingly beautiful. It's right on the lake, with many sites available next to the lake with beautiful views. Sites are large and on fairly level asphalt. There is lots of space between sites and site are often spaced so that you don't see any other rigs. We were there during the Balloon Festival and were able to see many balloons from our rig (although I would recommend going to the Bridge to view the balloons touching down on the water). We were there in the winter, so there were few boats on the lake, but I believe it could get very loud with boat noise in busier seasons. Beautiful campground! Definitely would stay here again! I would have rated this at 10, but it doesn't have sewer - only electrical & water. 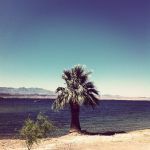 We camped at Lake Havasu State Park in a Fifth Wheel. Lake Havasu City, London Bridge, Hanger 24 (great beer, food, and atmosphere near airport), Topoc Gorge (GREAT food & fun), Nellie E Saloon Desert Bar (open only on weekends-up a rough 5 mile road-definitely worth a visit), Oatman (old ghost town where wild donkeys roam). This is one of the nicest state parks we have stayed in. Very spacious sites. The park has had some recent renovations yet retains a lot of its "wilderness". There are fire rings, nice cement pads at each site as well as picnic tables, some which are covered to provide shade. As is common in AZ, the park interior is mostly well maintained gravel with a lot of vegetation and some trees for shade. Nice bathhouses. There are two very large new boat landings on either side of the park with huge parking lots for the many boats that use the lake. There are lakefront sites which are $5 more but you have a great view of the water from most sites in the park except 22 & 23 (perhaps sites right behind these as well) so you may want to save your money and pick a non-waterfront site. There are large sandy beaches for everyone to enjoy. No sewer hookups but 2 dump stations on the way out. We have already booked a return trip. We camped at Lake Havasu State Park in a Motorhome. Hualapai Mt near Kingman is worth the trip. Beautiful scenery up in the mountain and a quaint lodge near the summit for dinner. Plenty of elk and deer up there. There is also lots of hiking. The Desert Bar out in the desert near Parker is also a fun trip but you need a AWD vehicle to get out there as the road out there is pretty rugged. Location, Location, Location. We stayed in this park in our 45' MH in a large back-in site. Our site backed up to the beach and the lake. The streets are all paved as well as the sites. The sites are spacious and with your neighbor at least over 100' away you will have plenty of elbow room. We had plenty of room for our coach and full size pickup truck. The park is right on the water with its own large beach area and is close to town and the London Bridge. The power and water was good. The only downside is there in no sewer but they do have a dump station and reservations seem hard to get as this park is in demand during the high season. I would definitely stay here again. We camped at Lake Havasu State Park in a Motorhome. Quiet park right in Lake Havasu. Sites are very level, lots of space between sites. You need to reserve early online as this place is usually full. If you are really lucky you can get a waterfront site that a private campground would charge you $90 for, but here the state park system is only charging you $35. Large white sand beach is the center of the park. No dogs allowed at the beach. Be prepared to get killed by mosquitos in the evenings especially near the lake. You will also enjoy nice shady trails and cactus garden. Every time you go in and out of the park, be prepared to wait behind others who are checking in, or getting a day pass. The biggest surprise to me was the size of the parking lot for boat trailer parking. It is the size of probably 3 walmart parking lots. Also remember as a courtesy to others, and only reserve a site length that is necessary for your camper. We saw 3 ft. long campers, and even tents using a 55 ft site when shorter sites were available. Large RV's can't get a reservation if small campers are using the long sites. We camped at Lake Havasu State Park in a Motorhome. Paddleboard right on the beach. Bring mosquito spray. This park got a "make over" recently and is very nice. Many of the camping sites are some of the most spacious I have ever seen. Our site was right on a very wide beach but even the sites not on the beach would offer a great view of the lake. You could easily take your lawn chair down to the water without bothering anyone if you weren't staying on a lakeside site and save yourself $10 per night. Sites are all gravel, restrooms look nice. They are building a new boat ramp on one end of the park and there was construction noise during day and generators pumping water out at night. Recommend staying at other end of park until that is completed. We would definately stay here again. We camped at Lake Havasu State Park in a Motorhome. Hiking, swimming, ATV/jeeping, boating, flea market on Sunday, boat to copper canyon (cliff jumping if you are brave enough! ), Desert Bar 4 miles out into desert- quite a trip! We were sorry we could spend only one night here. It is a lovely campground, located right on the shore of Lake Havasu. It was very quiet and pretty empty when we stayed on Dec. 14. We imagine it could get very crowded and noisy during the summer months. The grounds were clean, the sites spacious, and the location perfect. The staff were friendly and helpful, and we really enjoyed our stay. We didn't use the restrooms or showers so can't comment on them. Sites are pretty level, and it was easy to get settled in. Wish we could have stayed longer! Note: there is a multiple lane boat launch ramp being constructed very close to this campground, so it seems this campground could be hard to get into when it is boating season. The noise starts around 7 am, and not sure when the project will be complete. Just be aware of this potential issue. We camped at Lake Havasu State Park in a Motorhome. Bring snake repellant (you can buy it in garden depts) and shake it underneath your RV and vehicles. Are you affiliated with Lake Havasu State Park ?